RORATE CÆLI: Pope Francis: Catholics shouldn't breed "like rabbits"
Pope Francis: Catholics shouldn't breed "like rabbits"
"Clearer"... - but only for a couple of days. Another day, yet another Papal interview. 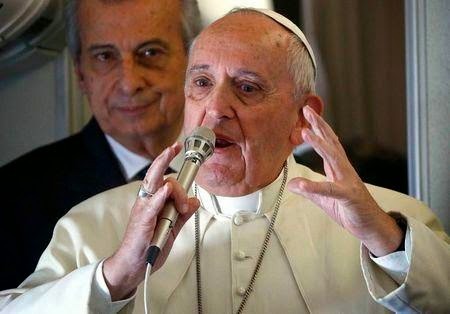 ABOARD THE PAPAL PLANE (Reuters) - Catholics should not feel they have to breed "like rabbits" because of the Church's ban on contraception, Pope Francis said on Monday, suggesting approved natural family planning methods. Francis spoke at length about birth control and population, issues that arose in the Philippines, where the local Church opposes a government law making contraceptives easily available. The leader of the 1.2-billion-strong Roman Catholic Church restated its ban on artificial birth control, adding there were "many ways that are allowed" to practise natural family planning. Read the rest, if you wish, here. Note: the phrase "responsible parenthood" had already been used in the conciliar document on "the Church and the modern world" -- Gaudium et Spes. But since the overwhelming majority of Catholic have not read it, prepare yourselves to hear this phrase -- a phrase long hijacked by advocates of contraception -- to be used more often, and hurled at large families who practice the Faith with full faith in The Lord.